Opening song, 'Stratmosphere' has an air of positivity about it and Benjamin show's off his many talents as everything you hear is done by him..he shows his guitar skills further in the instrumental atmospheric track, 'Welcome To The Galaxy' - I always enjoy a instrumental - well a good one! I think its a true test of musicianship if it can stand alone without the focus of vocals, as the instruments have to be melodic and stand out perhaps more to keep the attention of the listener..and that's just what he does! The short but sweet, "Venus Loves Jupiter" graces us with an elegant keyboard piece to ponder on between tracks, making for a perfect filler..
'Luna And Her Eclipse' has a very 80s rock vibe with a strong structure and well thought out clever lyrics and effective synth sounds, making this a stand out track.."Evolution" almost envelops the sound of what the 'mind's eye' would sound like whilst trying to visualise images and again provides a good break between songs. The intelligible, 'Spectrum III - Shapes And Shadows' follows on from the flow of the previous track making the album consistent with its ethereal sounds..
'Cosmic Love Web' again has an 80s vibe; the guitar-work shines throughout and compliments his vocals well and helps to tell his cosmic love song! 'Riding The Rings Of Saturn' has simplistic beats paired with complex guitars and although short it is well constructed as seen throughout. 'Purplexion' offers something a bit different in the form of an upbeat more stripped back acoustic number with good rhythms, reasserting his diversity. 'Spectrum V - Colors Of A Dream' ties in with the 'stratmospheric' snippets seen throughout, with a slightly more ominous feel to it making it one of the best instrumental pieces so far in my opinion. "Between Earth, Neptune and Mars" is a strong heartfelt love song, featuring some of best vocals on the album. The interestingly titled, 'S.A.N.D.S' (Suspended Animetion-Ninja Death Stars) sounds very ambient with strong melodic guitar from start to finnish! (Light Our Darkest Hour) 'The Final Revolution' is the longest song on the album with a slick guitar lick that drives the song and bursts into an epic sound. In this highlight Benjamin really struts his stuff, especially towards the end with impressive fast shredding! Nice!..Final track, 'Number Won' is really a continuation of the previous song as it echoes it, but is a clever revised remix which displays Benjamin's effective mastering and producing skills..sounds like triumph! 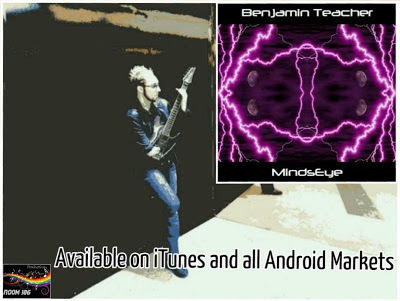 Benjamin has created a very versatile debut and has developed quite a characteristic sound for himself which he should be very proud of! By the end of the album you feel like you have been on a interesting and intriguing journey which he balanced well between the use of instrumentals and vocals. Benjamin proves that despite his limitations he can do just about everything..and I think we will be seeing more of him in the future! ‘Mind's Eye’ will be released worldwide via all digital download websites & Android market places such as iTunes, Spotify, AmazonMP3, Google Play, Rhapsody & many more.